ProAc Response DT8 review | What Hi-Fi? It’s been a few years since we last reviewed a ProAc speaker. Having spent some time with the new Response DT8 floorstanders, we wish it hadn't been so long. 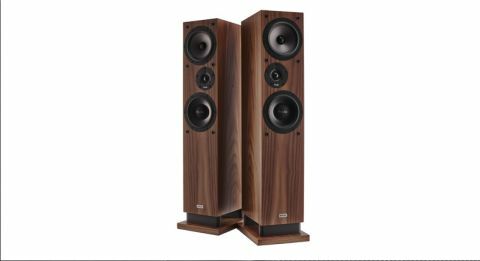 While not perfect, these towers turn in as musically cohesive a performance as we’ve heard around this price. The use of two types of 16.5cm mid/bass driver working in tandem may be clever from an engineering point of view, but visually it unsettles us. It looks odd – as does seeing the company name plastered liberally on the front of the speaker. It’s easy to see the logo on the tweeter faceplate, lower mid/bass driver and on the badge near the base of the enclosure. But look closer and you’ll also find it appears no less than three times on each mid/bass driver chassis, making nine times in total. We have no complaints when it comes to build though, which is as good as we’ve come to expect from ProAc. The 98cm tall cabinet feels immensely solid, and is blessed with crisp edges and neatly applied wood veneer. The enclosure’s walls use differing thicknesses of MDF to spread resonances. They are heavily braced and damped to give the drive units a solid, low-noise foundation to work from. There are five standard finish options – black ash, maple, mahogany, oak or cherry – so these speakers should fit well in most rooms. If you fancy something a little different there are two premium options – rosewood or ebony – for an extra £400. Why use two types of mid/bass driver? In engineering terms, there’s always a trade-off between the optimisation of midrange and bass performance in a drive unit. Designers simply end up with a compromise that best suits the product. By using different drivers working in tandem, ProAc’s engineers have attempted to get the best of all worlds - a polypropylene cone in the top unit shoots for natural mids, and a stiff poly mica diaphragm in the lower to deliver powerful-but-articulate bass. The trick is to get the two working seamlessly, which isn’t easy. Despite a nominal impedance of just 4ohms, the DT8s aren’t overly demanding of an amplifier. They’re pretty sensitive at 90dB, so there shouldn’t be an issue getting to high volume levels with most price-compatible models. These floorstanders use ProAc’s usual downward-firing port arrangement that vents to the sides. This configuration makes the speakers less fussy about room positioning than conventional rear-firing ported alternatives tend to be. In our test room we position the Responses around a metre into the room and well away from the sidewalls. We also angle them slightly towards the listening position to focus the stereo imaging. We start with Beethoven’s Fifth Symphony and the ProAcs respond with a large-scale sound full of force and fury. They deliver the music’s high-octane dynamic swings with enthusiasm and plenty of punch, yet have the skill to render the subtleties with care. Tonally, they are a little forward - but they have enough by way of refinement to prevent this being an issue. We would still avoid overly bright or aggressive electronics, though. Detail levels are high, with the DT8s able to resolve layers of information and organise it in a cohesive manner. They render instrumental texture superbly, and deliver slight changes in intensity and drive well. Stereo imaging is lovely too. These speakers paint on an expansive sonic canvas, and locate instruments with precision and stability. The orchestra is laid out convincingly, with the sound extending well beyond the space between the speakers. We move onto My Head is an Animal by Of Monsters And Men and the ProAcs continue to shine. They’re good at conveying the momentum on hard-charging tracks such as Mountain Sound, keeping all the music’s energy intact. There’s plenty of attack on hand, and that high level of insight we notice with the Beethoven piece just as apparent here. The DT8s keeps track of the music’s multitude of instrumental strands with ease. While the presence of two different types of mid/bass driver caused us to have doubts at first, we’re impressed by the DT8’s expressive and transparent midrange performance. Voices come through with clarity, and are nicely separated from the complex instrumental backdrop. We play Angel by Massive Attack – one of our favourite bass tracks – and the ProAcs continue to please. They deliver that insistent bassline with plenty of verve. There’s an impressive degree of agility, coupled to plenty of power and weight - the DT8s may be relatively slim speakers but there’s no denying their ability to deliver basslines with conviction. We really like these speakers. Slightly odd appearance aside, they deliver such an entertaining sound we can’t help but recommend them. Take a bit of care with system-matching and they will impress.